Sure, it’s important to have a designated quiet time where we carve out time to pray and read our Bibles. But it’s also important to have on-going conversations with God throughout the day. 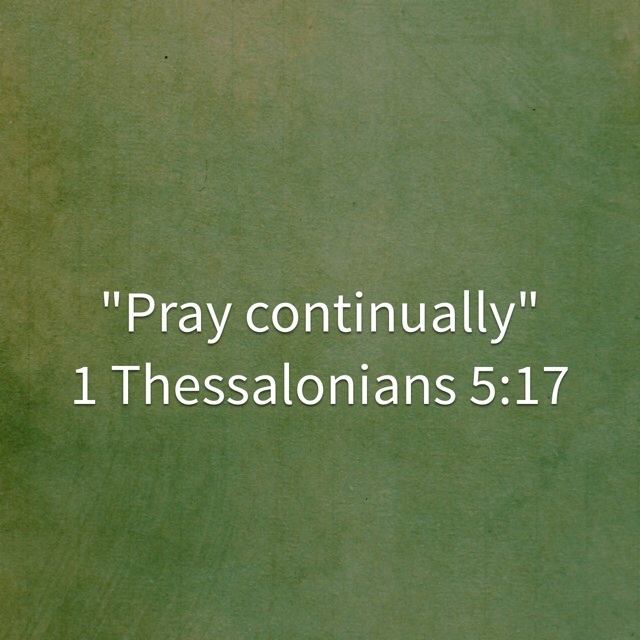 The Bible tells us to “pray continually” in 1 Thessalonians 5:17. There are lots of ways to pray continually throughout the day. If we aren’t careful, we can lock ourselves into that mentality. Then we end up not doing it at all because we are too intimidated that we won’t do it right. But what if we were to think about prayer this way–sitting across the table from someone just having a conversation? That’s exactly how the Lord wants us to treat Him. Praying continually is having on-going conversations with God. I read a Christian book one time where the author wrote about taking the Lord out on a date. My dad has also shared that he will even be driving in the car–praying–and he will pat the passenger seat as if he’s patting the Lord on the leg and tell God that he loves Him–just like he used to do with his daddy. I think the Lord likes that too. He wants to be involved in our day-to-day lives. He wants to be treated like He’s real–because He is! I love this. I often find myself praying when I’m at the school. Prayer does work. I too will not pray aloud or in front of people because I feel as if I’m not doing it right.